This Sunday, the Sunday of the Easter Octave, is Divine Mercy Sunday. It will also be the day that Bl. John XXIII and Bl. John Paul II are canonized as saints. Bl. John Paul II, being from Poland, had a special devotion to St. Faustina and to the Divine Mercy, was the one who formally designated the Sunday after Easter Divine as Divine Mercy Sunday, and died on Divine Mercy Sunday in 2005. This devotion to the Divine Mercy is based upon the writings of St. Faustina Kowalska, a Polish nun (1905-38) who experienced private revelations from Our Lord asking her to spread this message of the merciful love of God. 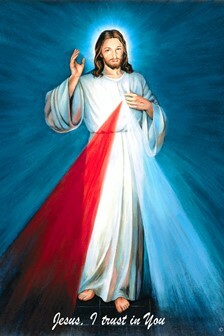 There is also the famous image based upon St. Faustina’s visions that show the blood (red) and water (blue/white) flowing from the pierced side of Christ that is the source of mercy with the phrase “Jesus, I trust in you” written at the bottom. 1. Be in a state of grace at the time of performing the devotion, have the intention of receive the indulgence, and have the interior disposition of complete detachment from sin, even venial sin. 2. Have gone to Confession within 20 days before/after this Sunday. 3. Receive Holy Communion, on the same day preferably, but up to several days before or after is ok.
4. Pray for the intentions of the Pope (no specific prayers are specified, but an Our Father and a Hail Mary would suffice). For more information on this devotion click here.